← Mother Nature Does It Best…..
We hear a lot these days about the importance of getting enough calcium. It is one of the most highly recommended supplements – heck even Dr Oz uses it! And for good reason too. Calcium is of course needed for strong bones – the mineral makes up @ 60% of their composition, and it is also needed for muscle/nerve signal transmission and a host of other functions. But if you do decide to take added calcium, don’t forget to supplement magnesium as well. Magnesium is also required for bone formation. Along with collagen it forms the matrix upon which calcium can collect and solidify. It also has an important role in energy production, and in the transmission of nerve impulses. Here its relationship with calcium is clearly shown. Magnesium has been called natures “natural calcium channel blocker” meaning it tempers the stimulating impulse of the calcium in effect. It therefore can lead to a more regular heart beat, lowered blood pressure and other cardiovascular benefits. In one recent review, published in the American Journal of Clinical Nutrition, an analysis of over 240,000 people found that for each additional 100mg of magnesium supplemented daily the risk of ischemic stroke decreased by 9 percent. Another meta-analysis recently published in the journal Diabetes Care showed a greatly reduced risk of type 2 diabetes among people who consume or supplement with more magnesium than is commonly taken. Diabetes along with obesity are hallmarks of Metabolic Syndrome and should be reason enough by itself to start pounding it down. If you do not wish to take your minerals in supplement form why not give my little dessert suggestion a try? 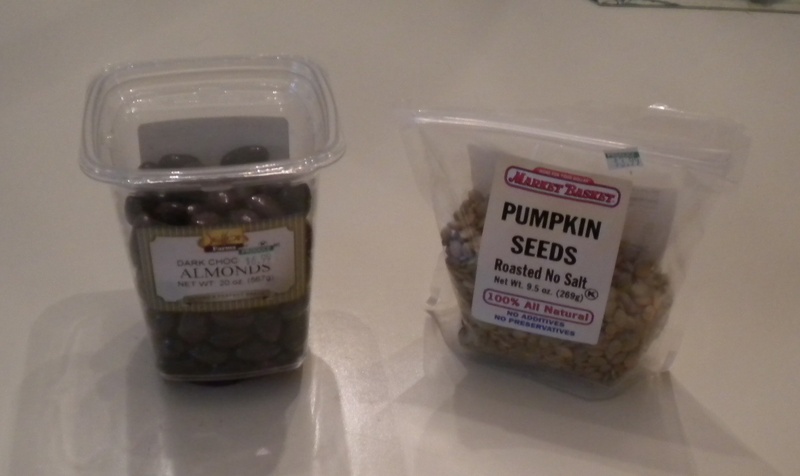 Pumpkin seeds are loaded with magnesium, nuts are another good source. Pumpkin seeds also possess the added benefit of urinary continence facilitation. They can help to elliminate those nocturnal trips to the bathroom. So they are the perfect after dinner snack. I like to throw a few of the chocolate covered almonds in with them to make em more enjoyable. It’s dark chocolate of course – which has its own list of serious health benefits. “Bone” appetit! This entry was posted in Diet, health, supplements and tagged antiaging, bones, calcium, dessert, food, health, magnesium, pumpkin seeds, supplements, sweets. Bookmark the permalink.